Note that Finnish eggs are among the safest in the world to be eaten uncooked. To find out why, read here. Flavour the oil with garlic: press the garlic clove through a garlic press and mix with the oil. Cover and let steep in refrigerator for a few hours or until the oil has absorbed the flavour of garlic. 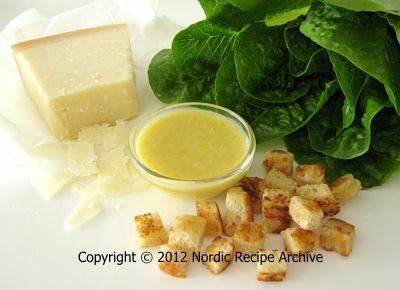 Picture on right: only a few basic ingredients are needed for a classic Caesar salad. Strain the oil and discard the garlic. If you want a more intense garlic taste, leave the pressed garlic in the oil. Wash the lettuce, drain well and tear the leaves into smaller, bite-size pieces. 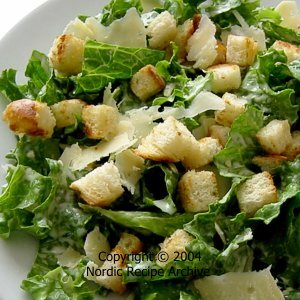 Shave thin flakes out of a lump of Parmesan cheese with a vegetable peeler. Prepare the croûtons following the instructions given here. Do not use any type of ready bought croûtons, they are usually hard as rock and taste stale. Put the egg yolk in a bowl, add the garlic through a garlic press and mix well with a whisk. One ingredient at a time, add the finely minced anchovy fillets, mustard, vinegar, Worcestershire sauce and lemon juice, mixing well after every addition. Finally beat in the oil, first one drop at a time, like in making mayonnaise, though this sauce will be a bit thinner than regular mayonnaise. You may reduce the amount of lemon juice to 1 tablespoon. The dressing can also be made in a small food mixer/herb chopper (not blender): pour the garlic-flavoured oil in the mixer, add the rest of the ingredients and process rapidly until smooth. Place all the ingredients except the oil in the mixing beaker, which usually comes with the blender, or if you do not have one, use any other tall and narrow container, just wide enough to fit the blade end in. Insert the blender into the container until it is touching the bottom. Without lifting the blender, press the switch to low speed and blend lightly for just a couple of seconds until the ingredients are blended into a smooth, frothy mixture. Continue blending on low speed and start adding the oil in a thin stream, moving the blender slightly up and down as you go. The mixture will quickly emulsify, forming a dressing almost as thick as mayonnaise. Note: when adding the oil, there is no need to be as careful as in making of mayonnaise. All the ingredients may be used chilled. Preferably, use 2 tablespoons of lemon juice. 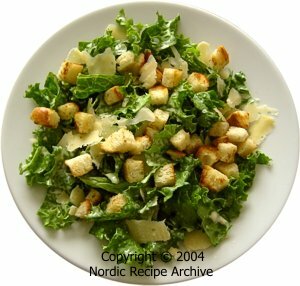 Put the lettuce in a salad bowl, pour the dressing over and toss. Sprinkle the Parmesan shavings and the croûtons on top and toss again. You may also add pieces of cooked chicken and/or crumbled bacon in the salad. Serve immediately, so that the croûtons remain crisp. Recipe source: Paula Nummela, MTV3/Teijan keittiössä, about 1992.